This year, i was approved for a press pass to cover San Diego Comic Con. That is right, the “Comic Con” of all Comic Cons and the show is big as its name is. If you were to tell me how big the convention center is, i would tell you that from one end to another, it will take you a whole 10-15 minutes to walk through it. I did that on Wednesday morning on preview night to get my idea of where to walk to and where are the offices. The place is massive and even without attendees there, i still felt like there was a crowd there. Before I went to the convention center, I seen the line for the Conan taping outside the studio and it was very very long even at 7AM in the morning. This was not compared to the massive lines i have seen inside and outside the convention center. There was a line for everything raging from getting a ticket for the autographs from select celebrities, to trying the escape rooms for South Park and Jack Ryan, and lets not forget about the dreaded Hall H line which ended all the way to the IMDB boat. That line itself looks very intimidating and i do not think i will ever attempt to wait on that line for a few days just to see a panel. The show floor was flooded with attendees and cosplayers walking to different booths and vendors or taking pictures. You could not look around to not see a cosplayer at all as there were a few each second. Many vendors that were there was Hasbro, Funko, Mattel, AMC, ABC and much more. I have seen many people in these booths trying to buy exclusive merchandise. The indoor panels were upstairs from the convention center and as much as people hated it, they close off the entire room (or in some cases the floor) if all the room’s lines are capped and that is good that they did that to prevent over crowding. But i enjoyed the show floor along with going to the Jack Ryan escape room. I was given a chance to preview that area before it was open to the public and that escape room done something i do not think i have ever seen and that is, re-enact the first few minutes of the pilot episode of the show. I was in a group of 10 people trying to solve puzzles and go to the next room. The first one featured money and a code, the second one tasked you to stop an enemy attack, the third one showcased an interrogation scene as the actors gave you clues to how to escape the room. This was an interesting twist to an escape rooms and i loved it. I was also invited to attend the Amazon Fire TV showcase to see their upcoming TV devices and features and there was a few themes inside that tent. It was a very good sight. AMC Network also had an attraction area for their shows Fear The Walking Dead and The Walking Dead and i was able to preview the attraction before it was open to the public and i have seen Jadis’ grinder machine, The Sanctuary (along with inside The Sanctuary where a guy demoed The Walking Dead: Our World mobile app game), the SWAT truck, the water slide with a pit of Walkers, and The Kingdom’s training area. That area always draws the attention of curious attendees and i believe that they were giving away Shiva Funko Pops to attendees once it opened. 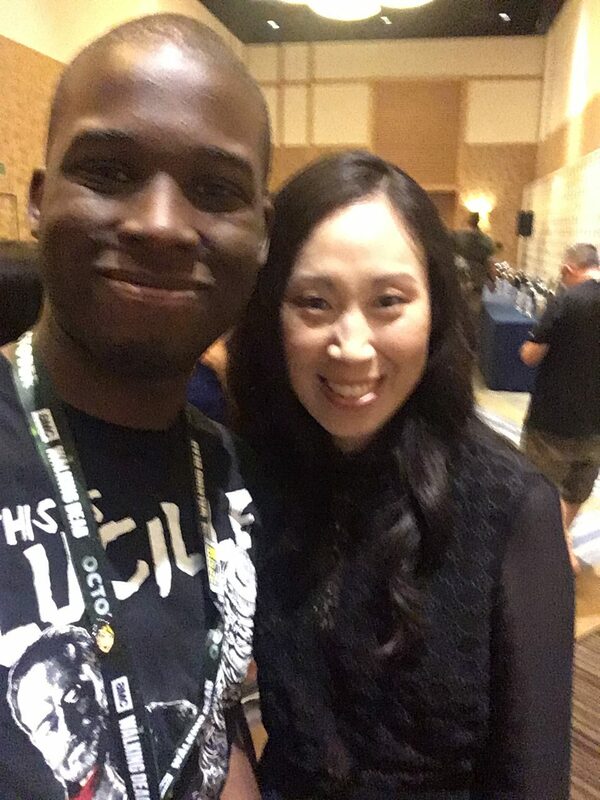 I also had the chance to attend press rooms at SDCC which is where the media work began. 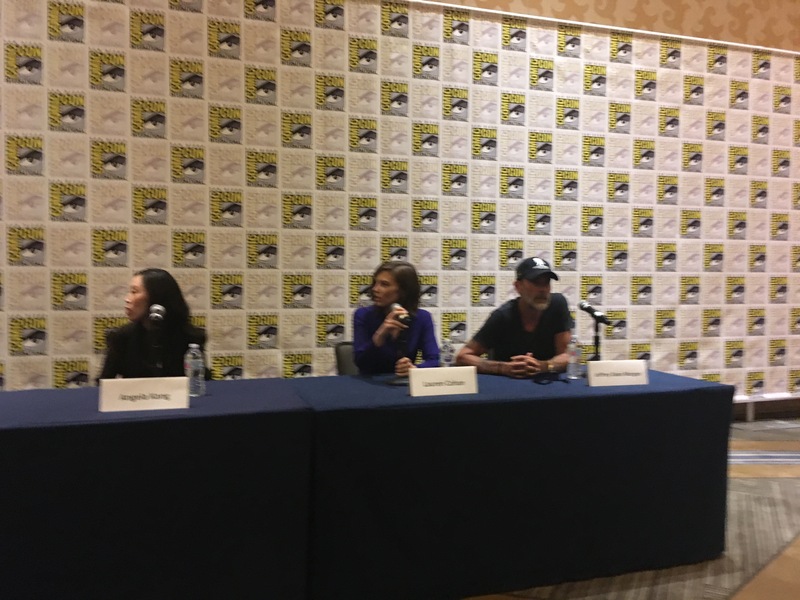 I spoken with the cast and key developers of different shows such as Impulse, Young Justice, Lego DC Super Villains (video game), BUYBUST, Crazy Ex Girlfriend, and MR. Mercedes. 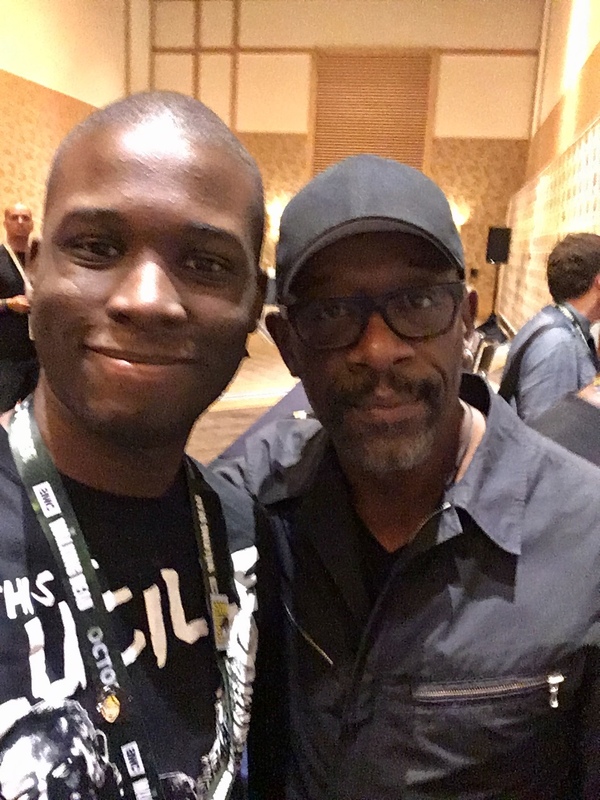 I was also invited to attend the press invited press conferences of Better Call Saul, Fear The Walking Dead, and The Walking Dead. I mentioned those three conferences in different posts in the last few days. 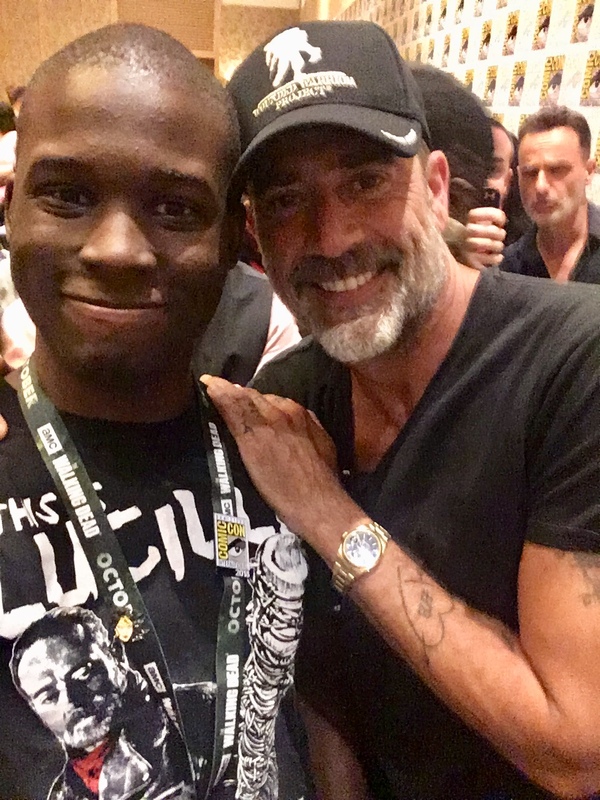 San Diego Comic Con is a great experience and i recommend everyone to check it out in 2019. Try to get tickets the day the sale opens or else you will be out of luck. 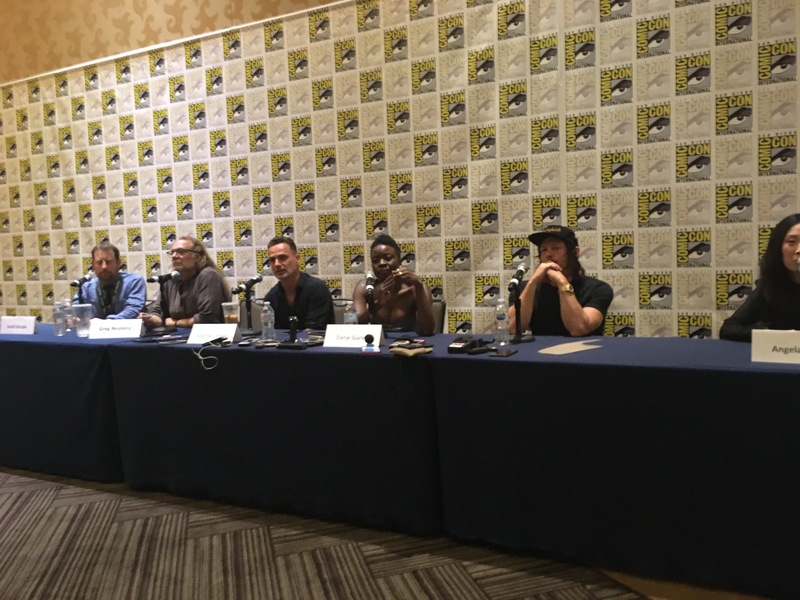 More San Diego Comic Con news came out as I was invited to attend both of AMC’s Fear The Walking Dead and The Walking Dead press conferences. The Fear one started first as the cast and producers of the season made their way to the long table. 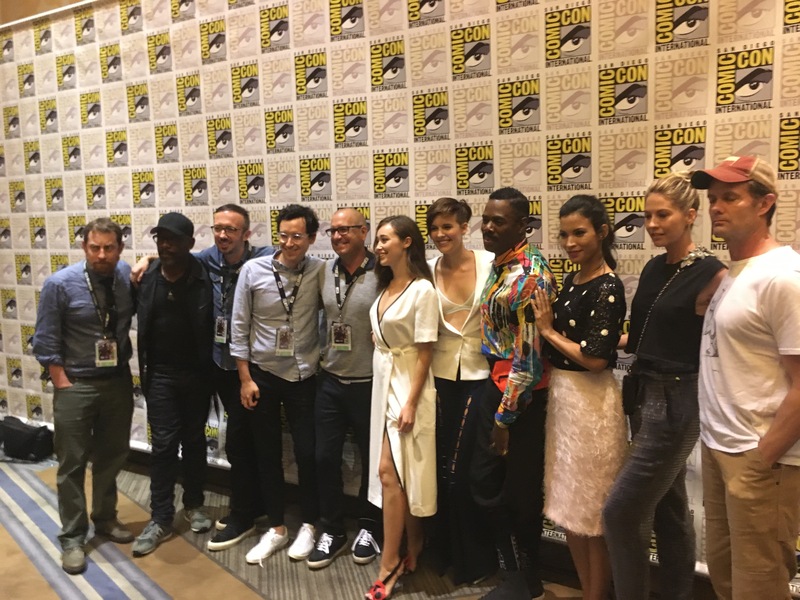 The cast included Colman Domingo, Alycia Debnam-Carey, Lennie James, Danay Garcia, Garret Dillahunt, Maggie Grace and Jenna Elfman as they all talked about what to expect from the second half of season 4 as the back half of the season deals with more character development and a natural disaster. 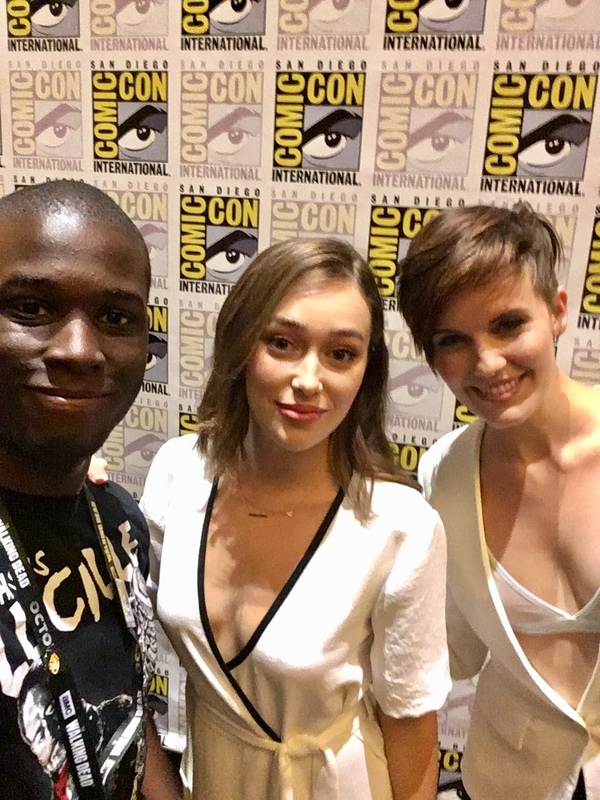 I also spoke with Alycia and Maggie for a few minutes after the conference to talk about Travis’ death way back in season 3. 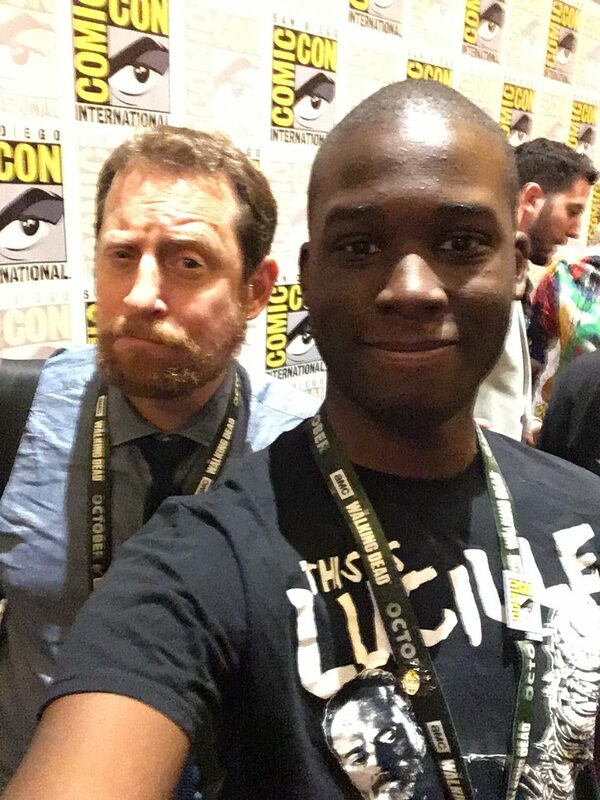 I also spoke with Scott Gimple as we talked about the comic series of The Walking Dead, his new comic series with Robert Kirkman Die!Die!Die, and future possible storylines of The Walking Dead especially since Volume 30:New World Order just finished not too long ago. After that conference was over, The Walking Dead started and we learned more information to the upcoming season and Andrew Lincoln’s departure of the show. That got sad to hear him say it because he loves the show and working with everyone there. 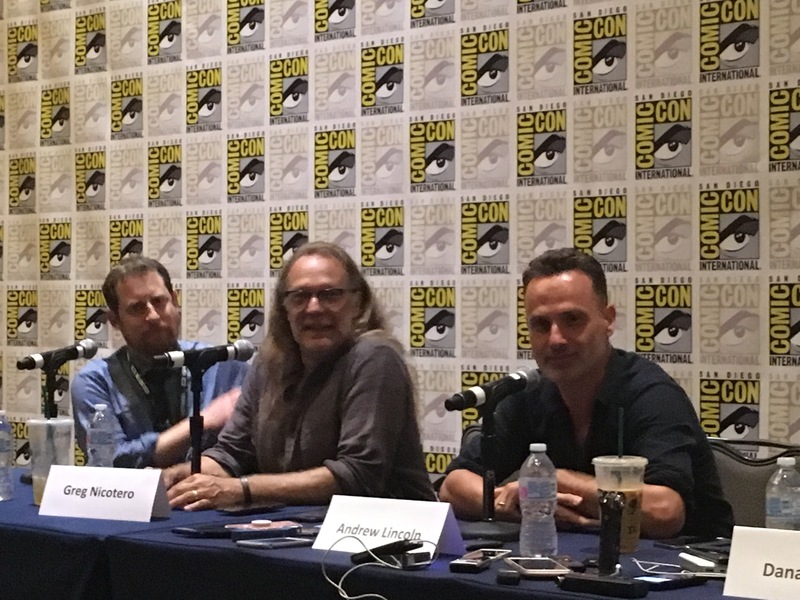 The Press conference was very funny also as Norman and Andrew Lincoln had a “stare down” after the rest of the cast arrived, along with Jeffery Dean Morgan stealing the show over there with his very funny humor. 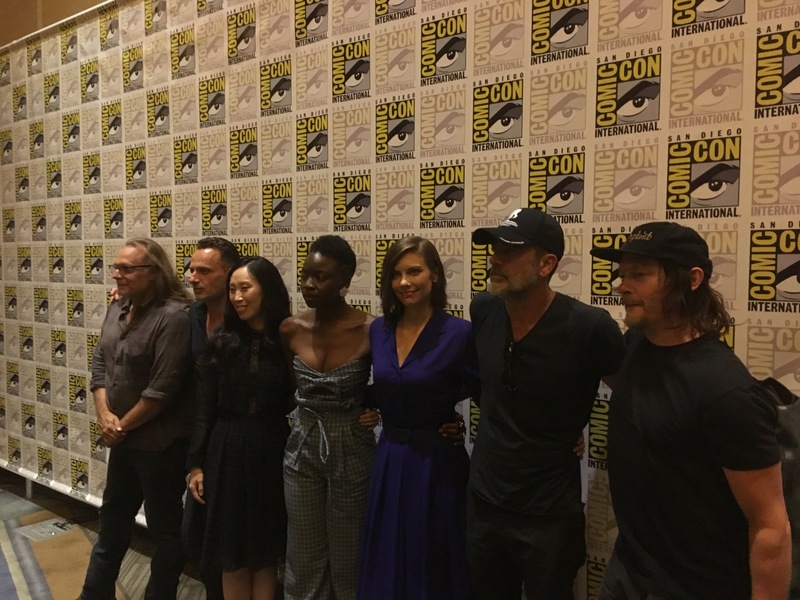 Other cast members that were there was Danai Gurira and Lauren Cohan along with Greg Nicotero and the new show runner Angela Kang and Executive Producer Scott Gimple. The panel is a must listen! 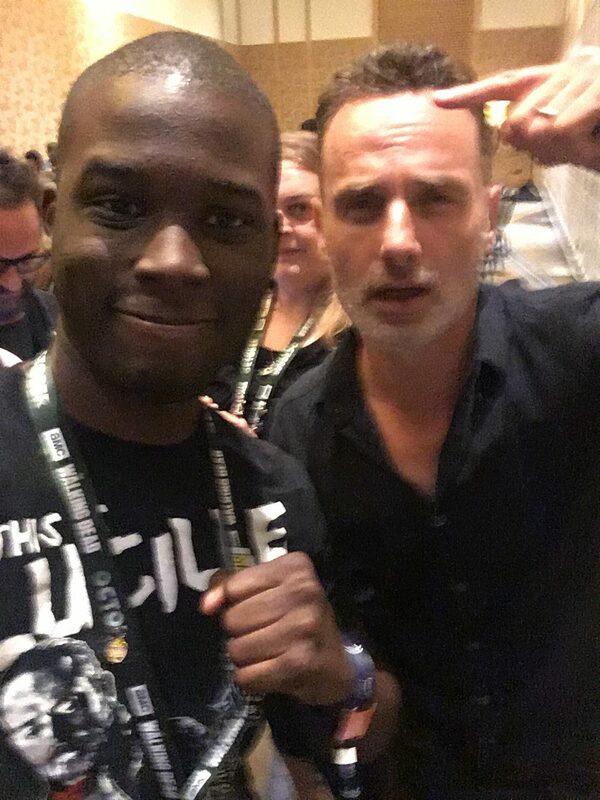 Meeting Andrew Lincoln face to face is a dream come true of mines and I am happy that it happened!